The Episcopal Commission for the Biblical Apostolate (ECBA) of the Catholic Bishops' Conference of the Philippines (CBCP) in partnership with the Philippines Bible Society (PBS), and other churches, is undertaking May They Be One Bible Campaign. This five (5) year nationwide campaign (2008-2013) aims to put a Bible in every home and encourage Filipinos to read and live the Bible resulting in the transformation of the Philippines. May They Be One is our response to the prayer of Christ for all of His children to "be one", (John 17:21) since unity is vital for making the Word of God accessible, understandable, respected and lived. It is also a call for oneness in individuals, families, and communities resulting in unity among various sectors in working for national transformation. This is a timely project that will respond to the need for low-cost or free Bibles for children and youth, soldiers, women and poor families. May They Be One is inspired by the Word Synod of Bishops in Rome on October 5-26 this year which has its theme, "The Word of God in the Life and Mission of the Church". Since this will mark a significant moment in the life of the Church and Catholic community worldwide, ECBA and PBS would like to seize this opportunity to put the Bible in homes,parishes and Communities throughout the Philippines. Archbishop Angel Lagdameo, President of CBCP and Walter Cardinal Kasper, President of the Pontifical Council for Promoting Christian Unity wrote letters of endorsement for the campaign. The campaigns aims to raise sufficient funds within the Philippines and overseas, to enable at least 5 Million Bibles - particular the ECBA - endorsed Basic Ecclesial Community (BEC) Bible to be sold at the subsidized price at P50.00 each, over 5 years period commencing in late 2008. It is also hoped there will be sufficient funds raised to allow for a certain number of Bibles to be given away free at the discretion of the local parish priest or pastor. The campaign could be a model for partnership among Bible Societies. The plan is to launch a nationwide donor/partner development program in the Philippines during Bible month in January 2009. Under the Theme: "Become a Friend of the Philippines Bible Society and help put a Bible in every home", Filipino Christians will be asked to join the Bible Society family and work together in making the Bible available at little or no cost to all Filipinos. ECBA and PBS set the launching of May They Be One information and publicity campaign with a Concelebrated Mass at the Manila Cathedral on September 30, 2008. It will be an ecumenical service to seek God's blessing on the Campaign and a send-off for the Bishops, led by PBS President Bishop Bastes, who are attending the Synod in Rome. Representatives from various sectors will be invited. A special May They Be One Bible will be dedicated during the service. The nationwide Campaign, "Become a Friend of the Philippine Bible Societyand help put a Bible in every home" will be launch during National Bible Week in 2009. Accordingly, the Bible week theme will be May They Be One, based on Psalm 133:1 and John 17:21. The over-all logo, a crimson, circular figure enveloping three stylized human figures in varying shades of blue evokes the heart of Jesus’ prayer in John 17:21 – that his followers may be united in all fashion and manner by which he is united with the Father. Hence, Jesus immediately distinguishes Christian unity from being mere organization, social action, cause-oriented assembly or any mere human attempt at gathering and community building. He did not call us just to convene. He called us to communion with God and with one another – to a unity of hearts, a unity of aspirations, a unity of lives. Jesus dreams of nothing less than for all of us to be completely united with him and to share in the fullness of his life. He desires that we share with him this dream. He draws us to himself. MTBO is a strategic program aimed to help ECBA and PBS realize the vision of a transformed Philippines through God’s Word. It is inspired by the 12th Ordinary Assembly of the Synod of Bishops held in Rome on October 5-26, 2008, which had as its theme, The Word of God in the Life and Mission of the Church. Objective: To provide Scriptures at subsidized cost that will help facilitate a moral and spiritual transformation throughout the country. with the Lord Jesus and mature in their faith. and give to MTBO for the continuous meaningful distribution of God’s Word. constituencies based on Scripture in order to animate the Filipinos. a. Diocesan Biblical Apostolate (BA) will be strengthened. BA is composed of Bible Director, Bible Coordinator, Bible Animator, and Bible Core Team. If a BA team is not in place, form a Parish Bible Ministry Team. b. MTBO Bible Campaign will not be exclusive to the BA structure. For other diocesan and parish lay organizations, their requests will be endorsed by the head/coordinator of the organization to the Parish Priest or Bishop. ii. 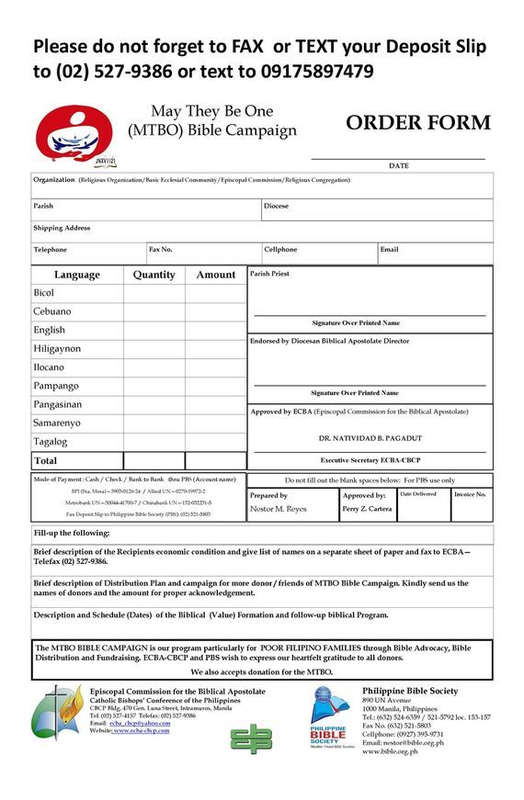 A prescribed form detailing the structure of the Parish Bible Ministry/Bible Team (Bible Formator/Animator) must be accomplished and submitted by the Parishes to ECBA/PBS prior to actual distribution. The number of copies of MTBO Bibles that can be availed of will be dependent on the number of registered poor families. All requests to avail of MTBO Bibles will have to be endorsed by a Parish Priest or Bishop. iii. Every year, pre-identified Dioceses from NCR, Luzon, Visayas, Mindanao, Cordillera and ARMM will be covered. iv. Emphasis is on Bible distribution to poor families attending Formation. Poor individuals/families who will receive MTBO Bibles must be pre-identified at the parish level. v. MTBO Bibles will not be sold in commercially in secular and religious bookstores. a. Parish/Church must prepare letter of request (addressed to ECBA), together with their distribution plan, list of recipients, and schedule of follow-up/formation plan. b. Request must pass through the Diocesan Bible Director for endorsement. c. Submission to ECBA for approval. d. Orders will only be processed and served by PBS upon receipt of payment and approval from ECBA. e. Delivery time is 3-4 days for stocks that will be picked up at the PBS office/warehouse. For provincial orders, allot at least 7 working days from date of approval of the order. f. Signing of Covenant. An agreement specifying that Bibles will be given to poor families only, will not be resold, and that Bible recipients will be provided Bible formation/training must be signed by requesting party. g. Institute a continuing Bible Formation program. h. Submit periodic reports and updates with photos and testimonies. vii. MTBO Bibles will be made available at a subsidized price of P50@copy. Total production cost isP150@copy thus a P100 subsidy per copy is needed. This will be sourced from various fundraising activities. viii. PBS will shoulder freight cost if total order is P10,000 and above. The Parish/Church will shoulder the freight cost for orders below P10,000. 3. Fundraising – Raise P500 million, here and abroad, to subsidize the printing and distribution of Scriptures in the local languages. The goal is to raise sufficient funds to enable at least 5 million Bibles to be printed and sold at the subsidized price of P50 each. Total production cost per Bible is P150. Organize Fundraising Dinners, Movie Benefit shows, etc. Presentation in churches, corporations, groups of prospective donors, etc. Tanong: Ano ang layunin ng MTBO? Tanong: Paano maisasakatuparan ang programang ito? Sagot: Makapagpalimbag ng limang milyong Biblia sa loob ng limang taon. Maipamahagi ang mga Bibliang ito sa murang halaga at magkaroon ng mahalagang pag-aaral at pagbabahaginan ng Salita ng Diyos sa mga parokya at iba’t ibang sekta ng lipunan. Tanong: Sino ang mga dapat makibahagi sa programang ito? 1. Mga taong may puso at kakayahang magbigay para mapunuan ang kaukulang halaga sa pagpapalimbag ng murang Biblia. 2. Mga pamilyang walang kakayahang bumili ng Biblia sa regular na halaga ngunit nais makibahagi sa mga programang magpalaganap ng Salita ng Diyos sa pamamagitan ng pag-aaral, pagsasabuhay, at pagbabahagi nito. 1. Murang Biblia para sa mga walang kakayahang bumili ng Biblia sa regular na halaga. 2. Biblia para sa mga taong seryoso sa pag-aaral ng Salita ng Diyos. 3. Tanging para sa mga taong dumadalo ng Formation sa kanilang simbahan. 4. Biblia na ipamamahagi sa pamamagitan ng lokal na simbahan. 1. Manggagaling sa mga parokya (parishes) ang listahan ng mga karapat-dapat na tumanggap. 2. Ang listahan ay ieendorso sa ECBA ng Diocesan Bible Director. 3. Ang ECBA ang magbibigay ng approval para makasama sa programa at makabili ng murang Biblia. 4. Ipapadala ng PBS ang mga Biblia matapos na matanggap ang approval mula sa ECBA at matanggap ang bayad mula sa parokya. 5. Patuloy ang pagsasagawa ng Bible formation sa mga parokya. 6. Pagbibigay ng report at litrato ng Bible distribution at formation gamit ang mga Biblia. "UNITE US IN YOUR WORD"
1. That bishops, priests and deacons, who have received the office of preaching may proclaim the Gospel without compromise in our times, let us pray to the Lord . . .
2. That the Lord's wisdom, protection, blessings of good health and strength will be upon the church and MTBO leaders and workers. 3. That the people of God may humbly listen to the Word, act justly, and love tenderly, let us pray to the Lord . . .
4. That communities and peoples in situations of conflict may listen to God's Word and strive to resolve their conflicts by abiding by the Gospel of peace, let us pray to the Lord . . .
5. That the poor in our country may receive the Word and find God's love and mercy revealed to them, let us pray to the Lord . . .
6. That those whom the Lord has blessed with material blessings may generously share their resources that the poor may receive the subsidized MTBO bible, let us pray to the Lord . . .
7. That all Christians may join hands in evangelization that we may give true witness to the Gospel, let us pray to the Lord . . .
O Father in heaven, we pray you listen to these our prayers that we may rejoice in the unity and peace that comes from You as we work and pray for the fulfillment of your Holy Will. We ask this to the one who prayed that we may be one, Christ our Lord, who lives and reigns with you and the Holy Spirit, one God, forever and ever. AMEN. M ake us, O Lord to Love your Word. T each us to listen and live by your Word. B less those who promote you Word. M ahalin po nawa namin ang Inyong Salita. T udloi kami sa pagpaminaw ug pagpuyo sa Imong Pulong. B endisyoni kadtong nagpakaylap sa Imong Pulong. When all of us live as one! Can you imagine all as neighbors reaching out to love? to believe and act God’s Word that will bring a change in our world ? We take a step to begin now! Can you imagine? Let us bring the Word of God to every home! Let us share and live God’s Word and be transformed! We will build our nation on good ground. We will see a brand new morn! We will see how peace will flow throughout our land! Now is the time to take a step. We believe, now love is born! The campaign for the world’s awareness of the “MAY THEY BE ONE” project happened during the celebration of the 12th Ordinary Assembly of the Synod of Bishops celebrated in Rome on October 5 to 26, 2008. The theme of the Synod, “The Word of God in the Life and Mission of the Church,” is clearly related to the biblical cause. One of the special guests of the Synod is the UBS General Secretary, the Rev. Archibald Miller Milloy. He was officially invited by the Holy Father to attend the Synod in his capacity as the Secretary General of the United Bible Societies because of the magnificent cooperation that exists nowadays among the UBS with the Catholic Church and all the Christian Churches in the world. The first event that introduced the MTBO campaign to an international group is what happened on October 10, 2008, when Rev. Miller Milloy, the General Secretary of the UBS, gave a reception at the House of the Dehonian Fathers, Villa Aurelia, Rome. The guests to this dinner were men and women connected with the United Bible Societies, the Catholic Biblical Federation and Catholic prelates attending the on-going Synod of Bishops. Several officials of various national bible societies, who happened to be in Rome, were among those who were present, such as the General Secretary of the German Bible Society and Mr. Mario J. Paredes of the American Bible Society. The Catholic Biblical Federation (CBF) was well represented. In fact the three leading CBF officials, who were Synod participants, were all present: Bishop Vincenzo Paglia (Italian), the CBF President, Mr. Alexander Schweitzer (German), the CBF General Secretary and myself, the Moderator of the CBF Executive Committee. High ranking prelates of the Catholic Church graced the occasion. Among them was Cardinal Polycarp Pengo, Archbishop of Dar-es-Salaam, Tanzania (East Africa). It was in Dar-es-Salaam that the 7th Plenary Assembly of the Catholic Biblical Federation was celebrated last June 24 to July 2 this year. Other Catholic personalities present at the reception were Archbishop Mark Benedict Coleridge of Canberra, Australia, Bishop Michael Ernest Putney of Townsville, Australia, and Bishop David Colin Campbell of Dunedin, New Zealand. There were many other personalities connected with the UBS and the Synod of Bishops, whose names I do not know. It was a sort of acquaintance party for people engaged in the biblical cause. Indeed the first word of the host, Rev. Archibald Miller Milloy, was an updating of the recent developments of the United Bible Societies in their cooperation with all Christian Churches particularly with the Roman Catholic Church. It was fraternal getting-to-know-you agape. The “after dinner” speeches started with Rev. Miller Milloy, who clearly explained the “updated” nature of the UBS. He pointed out that formerly the UBS was indeed exclusively for the Protestants or Evangelical Churches. But as an ecumenical spirit has been developing among Christian Churches in these past years, the UBS has ceased to be exclusively Protestant but has become an inter-confessional organization that is willing to serve or to cooperate with all Christian Churches, that is Protestant, Orthodox, Catholic and independent groups in just every matter regarding Sacred Scriptures. To my delight he cited the Philippines as a model of that cooperation, mentioning a unique project called “May They Be One” (MTBO) national bible campaign, which was launched on September 30, 2008 in Manila. Although the MTBO is Filipino it was a man from New Zealand who conceived of this national bible campaign, Mr. John Bergin, financial consultant for the UBS Asia-Pacific Region. Rev. Milloy requested Mr. John Bergin, who had arrived in Rome two days earlier, to describe this campaign to the dinner guests. Mr. Bergin gave just few remarks because he wanted me to elaborate on it, since it is really a Philippine project. In my speech I informed the audience that the MTBO was conceived a year ago in Manila, when John Bergin talked to me about this unique bible fund-raising plan in the presence of Mrs. Nora Lucero, the General Secretary of the PBS, and other PBS officials. His description of the aim of the project and how to go about it was so pleasant and convincing that I simply could not say no. Rejecting it would be tantamount to refusing God’s desire of spreading His Word to all the Filipino families. He added that this could be a model of cooperation among the national bible societies. He selected the Philippines for this project because of its strategic position and of its being the biggest Christian nation in the Asia-Pacific region. In a few words I informed the audience that the MTBO is an ecumenical endeavor of the Episcopal Commission on the Biblical Apostolate of the Catholic Bishops’ Conference of the Philippines and the Philippine Bible Society with the cooperation of other Christian churches. The noble aims of the MTBO campaign captured the hearts of the listeners: the unity of all Christians in response to Christ’s prayer, the social transformation and renewal of the Philippines by putting a bible in every Filipino home, to raise sufficient funds within our country and overseas to be able to distribute five million copies of the Bible in the next five years at low cost or even free for the poorest of the poor. Then I appealed to the “First World” countries to help the “The Third World” nations like the Philippines in our efforts to disseminate the Word of God because the poor are truly hungry not only for physical food but for spiritual nourishment coming from Sacred Scriptures. I cited some statistics that only 40 % percent of Filipino families own a bible in their home and that 98% of Filipinos are literate and so are able to read the Word of God provided they possess a copy of the Holy Bible. My speech must have touched the international audience because I received not only congratulations but concrete promise of help in our national biblical campaign. Mr. Mario J. Paredes, the Presidential Liaison of the American Bible Society for the Roman Catholic and Hispanic Latino Ministries, expressed his admiration for the MTBO and immediately invited me to come some day to the ABS headquarters in New York, where my appeal for financial help will receive a substantial backing from the authorities. He even gave me his calling card so that we could communicate with each other. Subsequently I showed his card to John Bergin whom I requested to accompany me to New York to promote the MTBO. The authorities of the German Bible Society likewise approached me later and expressed their desire to help our project. The Catholic Bishops of Australia and New Zealand were also willing to assist in our fund raising campaign. Thus the good result of that reception on October 10 as far as we are concerned is that the MTBO had been properly introduced to an international group, which admired the concept, encouraged us to implement it and even promised to offer monetary help. The Joint Statement was signed in the view of the public by the officials of the Catholic Biblical Federation and the United Bible Societies who were seated at the panel of the Press Office. The solemn act was well attested to by the presence of many media groups in Rome, radio, television and the press. Second event of October 14: In the afternoon session of the Synod Rev. Archibald Miller Milloy, being a special guest invited by the Holy Father, was given the privilege to give an intervention at the General Assembly for 4 minutes. His talk was well appreciated and even applauded. He made reference to the signing of the Joint Statement of CBF and UBS Partnership in the Biblical Ministry just accomplished some hours ago. Toward the end of his talk he cited the MTBO as a model of cooperation of a national bible society with the Catholic Church. Thus our project became known to the whole Church through the mouth of the General Secretary of the UBS. Fortunately there was a period of “free intervention” and I was lucky to be given three minutes to talk to the General Assembly as a follow-up of Rev. Miller Milloy’s brief mentioning of the MTBO. (This was the second time that I gave a talk at this Synod, for I had already given my official intervention of five minutes some days ago.) I elaborated a bit the aim of the MTBO and spoke at length of the magnificent collaboration of the Philippine Bible Society with the Catholic Bishops’ Conference through the Episcopal Commission on the Biblical Apostolate. An example of a concrete collaboration that has been going for many years is the publication of the Catholic Daily Bible Reading Guide, whose sample I distributed to the Synod participants by placing a copy in their respective pigeon hole. I also mentioned the National Catholic Family Bible Quiz, which is also being supported by the Philippine Bible Society. I ended up by requesting churches and bible societies of richer countries to support the biblical pastoral ministry of poor countries and by thanking the UBS and the PBS for their wonderful cooperation in our common concern to spread the Word of God to all people. The third event of that day happened in the evening. Bishop Vincenzo Paglia invited many Synodal participants to a reception given by the Community of San Egidio at the church of Sta. Maria di Trastevere. This community, founded by a layman, Mr. Andrea Riccardi, has a special love for the Word of God. Moved by the message of the Bible, lay men and women have grouped together to form a community that prays every day solemn and sung Morning and Evening prayers centered on Sacred Scripture. They do not only read, pray and live the Bible, they also do works of charity by feeding poor people every day. It is a wonder that at this time and age there are still many people who are drawn to a real Christian life through the power of God?s Word! Bishop Paglia, the CBF President, used to be the pastor of this community before being promoted to the Episcopal rank. The attendance at their inspiring Evening Prayers and the reception given by this community to several Synod participants was a fitting climax to this day filled with joy because of the blessings God gave to us biblical apostles. And finally the other assignment for me is to give a special sample of the MTBO Bible to the Holy Father. I wrote Archbishop Fernando Filoni, the Sub-Secretary of State (the “3rd man” at the Vatican), former Apostolic Nuncio to the Philippines, whom I know personally, to help us get an audience with the Holy Father in view of giving the sample of the MTBO Bible to him. It was our desire that all the Synod participants from the Philippines plus Mr. John Bergin of UBS would be present at that special audience. However, Archbishop Filoni called me by phone that at this time it is impossible to get a special audience of the Pope. The Synod officials suggested that I alone would give the MTBO bible to the Holy Father during a quick photo session which the Pope would grant to all Synod participants. My chance to have a photo session with the Pope came in the morning of October 18 during the coffee break when our English small discussion group would be greeting the Holy Father individually. I managed to give him the special Papal Edition of the MTBO (gold-edged with white leather cover). The Pope was amused with the gift and even asked me its significance; so we started to converse for a minute or two, apparently a forbidden act, taking too long, because the papal guard was shooing me away. My “long” encounter with the Holy Father enabled the photographers to take five different shots of myself and the Pope; four with the Bible and one without the Bible. As a sort of consolation for us Filipinos who were not able to see the Pope as a group, Archbishop Fernando Filoni invited us to a special lunch with him at his residence in the Apostolic Palace on October 22. Miss Elvira Yap Go, an auditor of the Synod and founder of the National Catholic Family Bible Quiz, joined us Filipino bishops (Archbishop Orlando Quevedo, Bishop Luis Antonio Tagle, Bishop Broderick Pabillo, Bishop Pablo David and myself) at the lunch offered by the Vatican Sub-Secretary of State. There was another Papal Edition of the bible with a brown leather cover. I gave it to His Eminence Cardinal Walter Kasper, the President of the Pontifical Council for the Promotion of Christian Unity, during my visit with him on October 24 at his office and residence in Via della Conciliazione. Cardinal Kasper had written a special endorsement of the MTBO project. He appreciated the gift because his English bible was already overused with torn pages. How inspiring to know that this German Cardinal has been perusing an English bible through the years! I gave samples of the ordinary edition of the MTBO Bibles to several friends and church dignitaries. My purpose was two-fold: as a souvenir of the Synod on the Word of God and as a reminder to help us in our biblical fund-raising campaign. Among the recipients of the meaningful gift from the Philippine Bible Society are: Rev. Miller Milloy, Bishop Paglia, Mr. Schweitzer, Archbishop Ignatius Kaigma (former member of the Executive Committee of the CBF), Ms. Teresa Wilsnagh (new member of the EC-CBF), Bishop Felix Toppo, SJ (my neighbor at the Synod hall), all the Filipino Synod participants, SVD confreres in Rome, personnel at the Pontificio Collegio Filippino and some others. I left extra copies of the 2009 Catholic Daily Bible Reading Guide at the Pontificio Collegio Filippino to be distributed to many OFWs in Rome and others who may find this leaflet very useful and practical. The 2009 edition also entitled “May They Be One” includes the fund-raising campaign to help “PUT A BIBLE IN EVERY HOME”. May the Lord continue to touch many hearts to help us in this huge and challenging project, which has started to gain acceptance and momentum in Rome. It is our hope that God’s Word may run fast from Rome to the whole world, as the Latins say “ab Urbe ad Orbem” (from the city to the world)!